Online Registration for the 2019 Hill & Dale Series is NOW OPEN. Click the button below to access the Online Registration Form and Full Series Details. Online Registration will close on Tuesday 23rd April at 9pm. It will then reopen after Race 3. Click here to learn more about the 2019 Junior Hill & Dale Races. All sessions start at 6:30pm. Hill and Dale Race 3 will take place at Slieve Martin on Thursday 25th April 2019. The race is 4.25 Miles / 1,740 ft. Full body cover must be brought to the race. There will be kit checks at the start and finish of the race. Car parking will be free for all competitors in Kilbroney Forest Park. Registration will open at 6:30pm and close at 7:15pm SHARP. Online Registration is NOW OPEN and will close on Tuesday 23rd April at 9pm. Please note that you only need to register ONCE for Series. Entries will NOT be accepted on the night if you did not register online. 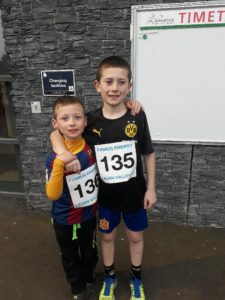 Newcastle AC Juniors attended the first meet of the Firmus Fab 5 Series at the Mary Peter’s Track on Thursday 11th April, taking part in 9 events collectively. Calum Cope won his heat in the Under 13 Boys 100 metre race. Calum also came a commendable third in the Under 13 Boys Long Jump competition. The O’Gorman family were out in force with Daire, Thomas and Aoibheann taking part in 7 events throughout the evening. Well done to Daire and Thomas who both took part in the Under 11 Boys Long Jump and 60 metre race. Aoibheann competed fantastically in the Under 13 Girls 100 metre race, 800 metre race and Shot Putt competition. Saturday March 30th saw race 2 of the NIMRA championship take place in Newcastle, the classic Donard Commedagh route. Starting in Donard Park, runners have a free route choice to checkpoint 1 at Thomas’ Quarry, followed by a long climb to the top of Donard for checkpoint 2. A steep descent continues down to the saddle before climbing again to the tower on top of Commedagh, for checkpoint 3. From here, there is a narrow ridge leading to Slievenamaddy, then a slippery descent to the edge of Donard forest for checkpoint 4, a quick dash through the woods brings you back to the finish line. The section between checkpoints 3 and 4 is difficult to get right on a good day, and once again it proved decisive in many people’s race. A trio of NAC led the charge to the quarry, Seamus Lynch, Zak Hanna and Mark Stephens, followed by Newry AC’s Kieron Kelly and then Timothy Johnston and Johnathan Scott, both of Mourne Runners. On the slopes of Donard, Hanna showed his superior climbing skills leading at the top by over 2 minutes, a lead which he held to the top of Commedagh. Although, it wasn’t raining, a cloud had parked on Commedagh’s summit, making it impossible to find the ridge without a compass bearing or good knowledge of the terrain. By the time runners were visible again at checkpoint 4, Lynch was now in the lead followed closely by Stephens then Hanna, with positions remaining the same to the end. Lynch took his 2nd win of the championship in 1:03:56, Stephens 1:04:25 and Hanna 1:05:29. Next home for NAC, having an excellent race, was Gary Mc Evoy in 6th place in 1:13:39 followed closely by a man who is making a return to the mountains after a short break, Colum Campbell finishing 8th in 1:14:26 and 2nd MV45. In hot pursuit was regular Fell racer, Pete Grant, finishing 9th in 1:15:25 and 1st MV50. A handful of NAC men followed, Sean Russell 19th in 1:22:28, Gerry Kingston 31st in 1:29:42 and 3rd MV55, Declan McElroy 32nd in 1:31:01, Barry Wells 41st in 1:36:04, Eugene McCann 1:43:01, Stephen Graham 2:02:35 after loosing a lot of places on Commedagh, and Nigel McKinney 2:11:31. The ladies race was led by Megan Wilson and Mourne Runners’ Sarah Graham all the way to the top of Commedagh, before the mysterious fog sent both girls on a tour of the Mournes. This left the door open for Newry ac’s Esther Dickson, who expertly navigated her way to safety, taking the win in 1:15:33 and 10th place overall. 2nd place went to another great navigator, Lagan Valley’s Shileen O’Kane in 1:24:10 and 1st FV50. Finishing the female lineup was Omagh Harriers’ Ciara Largey in 1:25:34. Just missing out on the podium for NAC was Áine McCann who finished 4th in 1:33:25, followed by Mari Troeng 6th in 1:36:22, Paulette Thomson 7th in 1:38:26 and 1st FV45, Catherine McIntosh 2:02:15 and Bronagh McInerney 2:24:26. There was also a prize for the fastest male and female going between Donard and Commedagh, generously sponsored by Hanna Bros. Taking the titles here were Seamus Lynch and Esther Dickson making it a win win for both of them. When everyone eventually made their way off Commedagh they were well fed and watered by host club Mourne Runners. Race 3 of the championship takes place on Thursday May 2nd at 7:30pm, the H&D Binnian race. 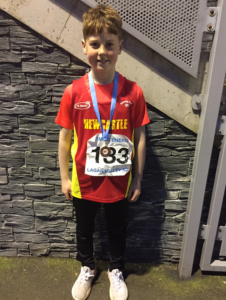 Exciting news – Newcastle AC announces 3 Junior Hill & Dale races! Last year we recognised the strange anomaly – that 15 year old athletes could compete internationally in Mountain Running, but there were no local races for them to train and compete in, before making this transition. Newcastle AC came to the rescue and is allowing athletes aged 14 & 15 to compete in 3 races, to give them a flavor of our favourite series and help these young athletes prepare for full competition when they turn 16. One of the races has been slightly shortened to comply with distance regulations for under age runners. Junior athletes aged 14 or 15 at the time of the start of the Hill & Dale series will be able to compete in this mini series. Junior athletes will start each race with the seniors. Race 2 – Tollymore – slightly shortened race – 14 & 15 year old athletes will start with the seniors, but will turn at the boundary wall to join the descent route to the finish. Race 4 – Binnian – 14 & 15 year old athletes will be able to run the entire uphill course! Race 7 – Millstone – 14 & 15 year old athletes will be able to run the entire up and down course! As an added bonus the N.Ireland Mountain Running Association (NIMRA) are offering the male and female winners of the series, a place on their International Squad for 2019. All junior athletes should comply with the same safety advice and equipment requirements of the senior athletes, but they will have the addition of a parental permission aspect that is included in registration – this will apply to all junior athletes. This is particularly important at the Millstone race, where navigation can play a part in poor visibility. At each of the 3 races, Phil Hodge will be available to answer questions that any new junior or parent might have about that nights race. Online Registration will close on Tuesday 9th April at 9pm, but will reopen after the 1st race is completed. An athlete only needs to register once for the series. Note – If an athlete is born in 2003 between Jan and April, they should contact Phil Hodge via the above e-mail in advance of Race 1 at Castlewellan.